• Easy for little hands to snap together and take apart. Designed for kids ages three and up, the sets are just the right size for little hands to connect, take apart and build new, unique designs. They are also helpful in strengthening children’s motor and problem-solving skills. • They come in a variety of shapes and sizes. Construction sets are available in 8 different designs, allowing children to create whatever they can dream up. Various shapes include a 29-piece princess castle, a 26-piece race truck, and several dinosaurs, including a brontosaurus, tyrannosaurus rex and triceratops. • VELCRO® BLOCKS™ construction sets are safe and mess-free. The soft, easy to manipulate toys are easy to clean up and put away when playtime is over. • They provide hours of endless imaginative play and fun. 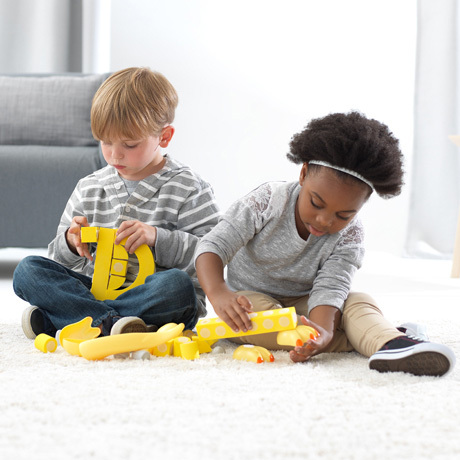 VELCRO® BLOCKS™ inspire kids to create new shapes and structures, whether they are playing solo or with friends. What’s more, they’re engaging and provide endless fun! Kids will love playing with VELCRO® BLOCKS™ construction sets, and parents will be thrilled to see imaginations at work. They are available online at Velcro.com, Amazon.com and will be in-stores at TOYS R’ US (Canada) and a number of select Specialty Toy Retailers. Prices start at $19.99.